The stars of any summer picnic or backyard bash are seasonal fruits and veggies. The problem is, some of them don’t come in the most user-friendly packages (looking at you, pineapple). But don’t nix your plans for putting grilled produce on your party menu—with some genius tips and a good knife, prepping them will be a breeze. At least, according to Alison Cayne, the owner of Manhattan cafe-slash-cooking school Haven’s Kitchen and author of the Haven’s Kitchen Cooking School Cookbook. She reveals the easiest methods (and some I-can’t-believe-I-never-thought-of-that hacks) for cutting everything from watermelon to cauliflower into bite-sized pieces. Scroll down for video tutorials that will make you a knife skills master in no time. 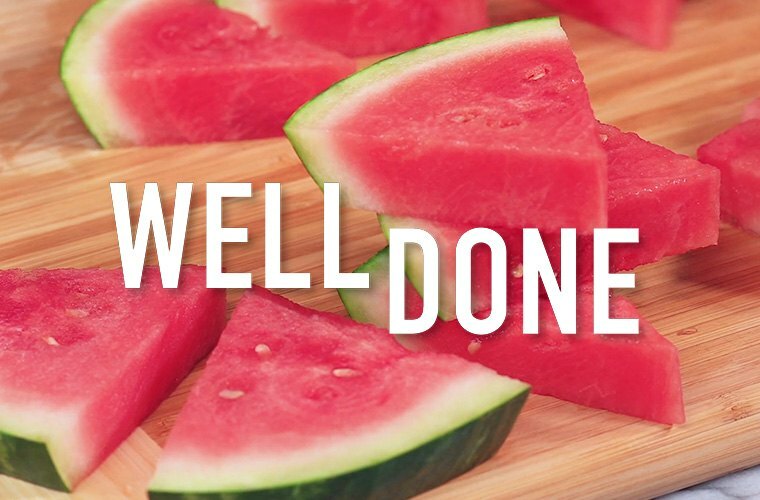 Show off your enviable new knife skills by slicing up a watermelon at your next summer BBQ. This technique is way easier (not to mention less messy) than the the standard slice and score method—and features a secret trick for keeping the melon from sliding all over the counter. If you’ve ever considered buying a whole pineapple at the grocery store only to very quickly reconsider at the sight of its intimidating-looking prickly skin, this method is for you. The trick is using a sharpened, serrated knife to slice off the skin, halve the pineapple, and chop into cubes. Turns out DIY pineapple chunks don’t have to be a scary experience after all. You might think being a meal-prep pro means you’ve mastered the art of slicing vegetables, but chopping salad toppings is much different than prepping veggies for the grill. For the full summer experience, transform your outdoor space into a backyard oasis and serve this low-sugar rosé-mezcal cocktail.